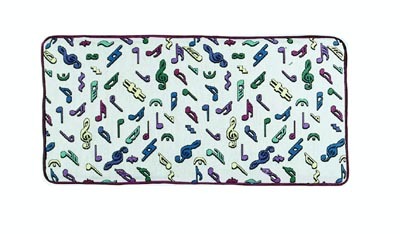 Musical Notes Tapestry Cushion is rated 4.28 out of 5 based on 109 ratings. These colorful cushions are great in pre-schools, montessori and elementary schools, anywhere where people are young at heart! Also we've made many for children's hospitals, nursing homes and any setting where cheerfulness and hope abides! Sharps, flats, rests and all manner of colorful music notation adorns this bright colored tapestry cushion. Choice! The backing, piping and four ties are available in your choice of the satin polyester colors. Choice! This cushion comes standard in three sizes. Now comes in 1", 2" or 3" thickness! Another Choice! NEW! You can now have us make a custom-size cushion to perfectly fit your bench or church pew! See 30079_C for a custom size item or call us at 800-792-4457 so we can email you a quote on one.